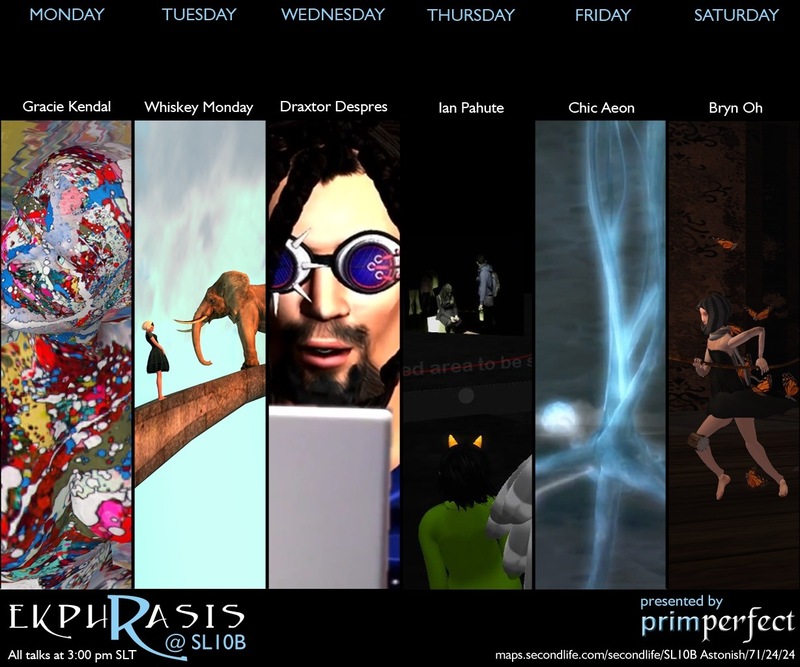 As the Second Life community celebrates this milestone anniversary, it’s a great time to reflect on the contributions this virtual world has made to contemporary art. This year, my third year of interviewing artists at the birthday celebrations, I am very excited to welcome a group of talented and seasoned artists whose work perfectly represents the diversity and potential of virtual art, and particularly the ways in connects to practice in the physical world. We will kick things off chatting with Gracie about how her work has evolved from showing her paintings on prims, to a Master’s thesis, to now displaying works in a Beverly Hills art gallery that are directly inspired by her virtual creations. It will be a great start to talking about augmented reality, which will be a running theme throughout the week. I’m incredibly excited to talk to the talented and quite frankly hysterical Whiskey Monday on Tuesday. Those familiar with her stunning and surreal images might be surprised to learn just how short a time she’s been making virtual photographs. We will learn more about how she began, and how she works, and maybe a little about what makes her tick. Drax has been a tour de force in SL media for several years, but I think his series the Drax Files is not only some of his best work, but is critically important in documenting what is happening in SL today. I’m looking forward to interviewing the interviewer, and hope to pick up a thing or two! Ian is an artist and technologist who also has a long history of creating virtual art, and he’s most recently broken the virtual wall with his exhibition EXTRACT/INSERT which was shown at both the LEA and in ‘real life’ at the Herbert Art Gallery in Coventry. I had the pleasure of visiting this piece from both sides, and we will chat about this work and where it might go from here. Chic makes some of the best machinima around, and now she’s embarked on a project at the LEA to create a dedicated space for machinimatography. We will talk about this groundbreaking new media art form, and get advice from her about how budding film makers might get involved. On Saturday I’ll be talking to Bryn… About everything. What’s more to say here, it’s Bryn! All talks will be at 3pm SLT at the SL10B Auditorium. Don’t miss the other great talks Prim Perfect sponsors, meeting incredible designers and the people who make the community fun! See the auditorium schedule here. Thanks to PJ Trenton for the lovely poster. Previous Post: A final visit to the Home and Garden Expo for Designing Worlds!